Road4FAME recently onboarded two new industry partners as consortium members, which are now officially endorsed by the European Commission. ATOS Spain will support the project’s main roadmapping process. ATOS marks 25 year of experience participating in EU projects and is ranked in the top ten global IT services providers and the number one European player. Having acquired deep technology expertise and industry knowledge, the firm brings particular expertise to Road4FAME in ICT manufacturing product-service systems and interoperability. THHINK Wireless Technology Ltd. will support the project in developing business models. The company was founded in 2009 after more than a decade of R&D in wireless and energy harvesting technologies. THHINK is a leader in the development of innovative new products for strategic monitoring of remote assets, equipment and environments in the aerospace, marine, automotive, rail, automation and agricultural sectors. THHINK engineers have many years of experience providing proof-of-concept research, business case trade studies and products for Formula 1 Racing, Airbus, Rolls-Royce, NASA, the Olympics and the MoD. The Road4FAME coordination team is very much looking forward to work with these two excellent partners. On March 24-25, representatives of over 150 Factories of the Future (FoF) projects joined the 2014 Impact Workshop of the FoF-PPP. The purpose of the workshop was to identify common themes, potential synergies, and to strengthen cooperation among projects. The workshop was structured on the basis of a clustering of projects into six themes, based upon the ‘Factories of the Future’ roadmap. 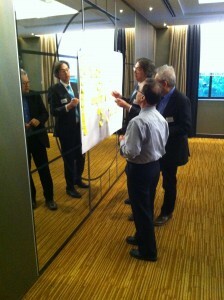 Road4FAME was represented in the session ‘Cyber-physical Systems & Networked Factories’. Ursula Rauschecker of Fraunhofer IPA, Germany, presented Road4FAME and its mechanisms to achieve involvement of a large number of stakeholders in the roadmap development process, namely the Road4FAME Core Group and the Road4FAME Experts Group. Ursula also gave an overview of the roadmapping ecosystem in the FoF PPP and described the close interactions of Road4FAME with past and ongoing initiatives such as the ActionPlanT project, EFFRA and the Pathfinder project. The Road4FAME presentation from the session is available here. 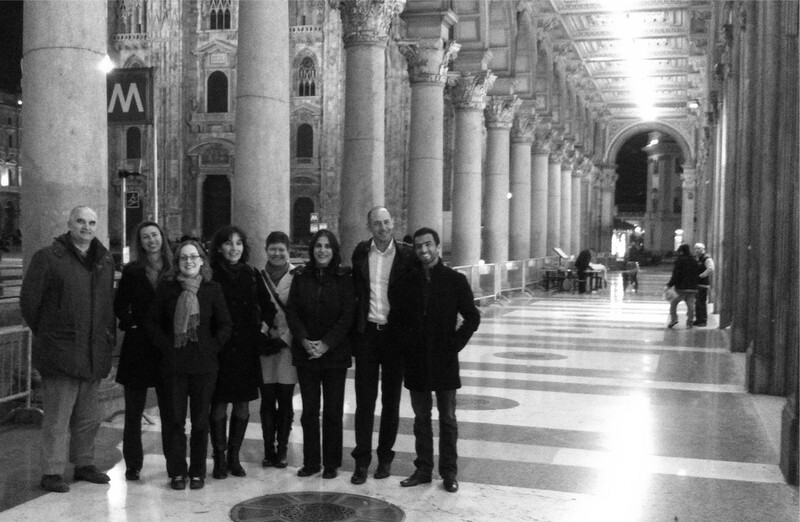 In order to support the preparation of the roadmap, 22 members of the Road4FAME Experts Group from industry and academia from across Europe came together on March 6, 2014 in Brussels for a full-day expert workshop. Motivation for joining this first workshop was impressively high underlining the relevance and importance of the topics discussed. 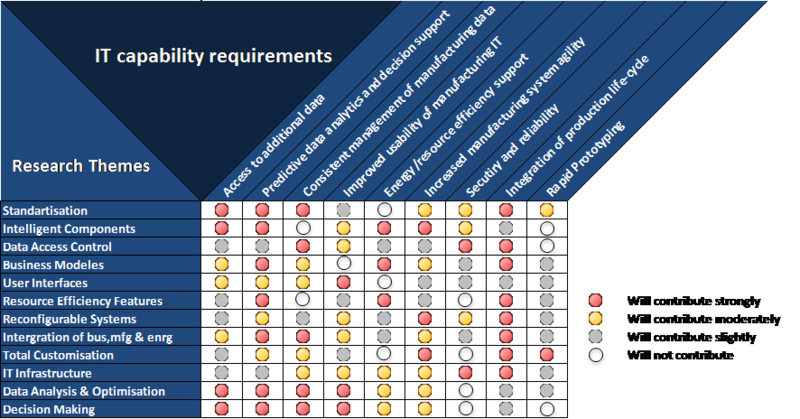 The workshop’s main objective was to establish a comprehensive overview of the most urgently required IT capabilities in the manufacturing domain, research challenges in manufacturing IT as well as IT enablers. Furthermore, four manufacturing scenarios to be considered in Road4FAME were presented and jointly refined in discussions among Road4FAME consortium members and the participating experts. 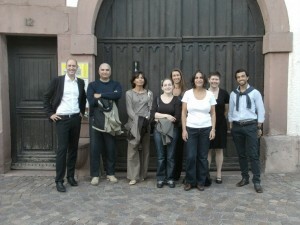 The objectives of this first workshop were met thanks to the very active contribution of all participants. According to the feedback received post workshop, participants considered the workshop worthwhile and its outputs positive. In an anonymous post-workshop survey, 93% of respondents rated the workshop as very good or excellent. 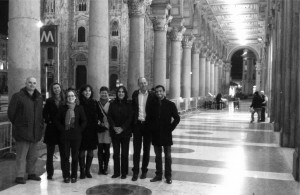 The objectives, activities and methodology of the Road4FAME project were presented at the European Commission’s strategic conference on Cyber-Physical Systems: Uplifting Europe’s innovation capacity, which took place in Brussels from 29-30 October 2013. 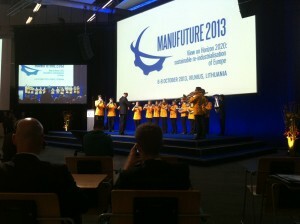 The two-day conference was co-organized by DG CONNECT of the European Commission and Road4FAME coordinator Steinbeis-Europa-Zentrum, featured by ARTEMIS, the embedded systems industry association. It brought together highly qualified experts from the embedded systems and cyber-physical systems community in order to discuss their current and future research agendas. Likewise it presented a great opportunity for innovators and industry to assess the current standing of technological progress in manufacturing IT. 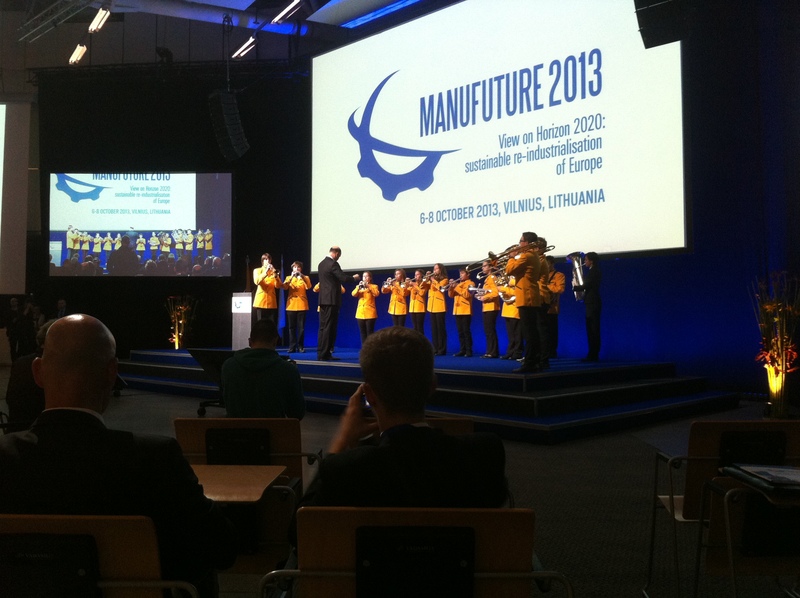 An inspiring and well-participated Manufuture 2013 Conference has come to an end. To Road4FAME, the conference was an excellent opportunity to get an overview of emerging trends and ongoing research efforts in manufacturing IT. Also, we were able to meet participants with highly relevant expertise for Road4FAME. We much appreciated the interest of manufacturing IT experts to join and contribute to Road4FAME and are happy to report a steep increase in members of our Road4FAME Experts Group subsequent to the conference. An important starting point in the development of a roadmap is the establishment of an overview of existing strategic documents. For Road4FAME, one of the most important strategic documents in this regard is the research agenda put forward by the ActionPlanT project. On October 1st 2013, members of the Road4FAME project met for a full-day workshop with members of the ActionPlanT project to discuss their research agenda in detail and to get their guidance for taking up the ActionPlanT results appropriately in Road4FAME. The consortium is thankful for the strong support received from ActionPlanT coordinator Anirban Majumdar of SAP, Marc Soignet from Platte Consult, and Sonja Pajkovska-Goceva from Fraunhofer IPK. The ActionPlanT strategic research agenda will serve as a solid starting point for our roadmap development in Road4FAME and we look forward to continuing regular consultation with members of the ActionPlanT project by means of the Road4FAME Core Group. 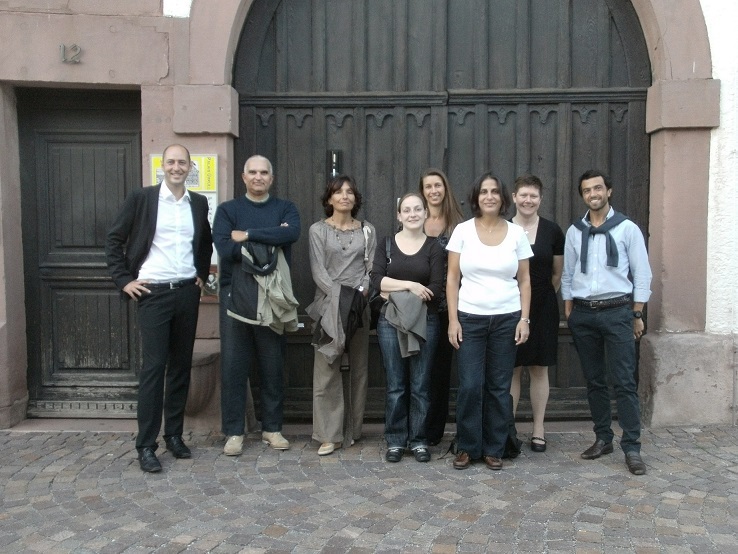 After an official project start in summer 2013, the Road4FAME consortium met on September 2nd and 3rd on the premises of project coordinator Steinbeis-Europa-Zentrum in Karlsruhe, Germany, to form a joint understanding of the work ahead. Being considered a successor to the ActionPlanT project sets high standards but the consortium is confident to live up to expectations with the set of strong partners united in Road4FAME.